Yesterday was a huge day for Legends fans. I was the most excited I’ve been about the game since it was first announced last year! I was completely taken aback, seeing what a Legends game made in this decade can be. I am so looking forward to the prologue game. Who’s ready to wall-dash? Since it’s Friday, let’s get some art up in here! Today I’ve got a few images from Secret of Rockman EXE as well as the Mega Man Battle Network Official Complete Works. It’s all about the support animals! 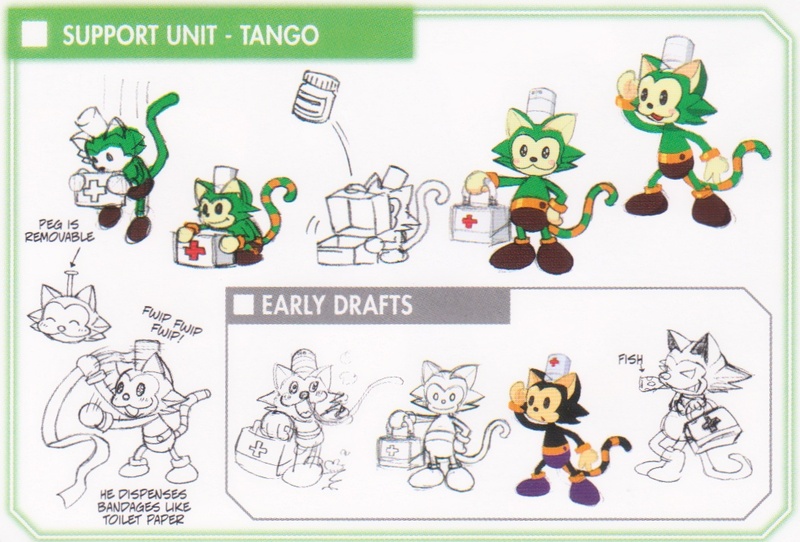 Rush, Beat, and Tango were classic Rockman’s pets/helper robots. They were also adapted to the world of Battle Network, starting with EXE3 as support programs for the navi customizer that could only be used in player-vs-player battles. 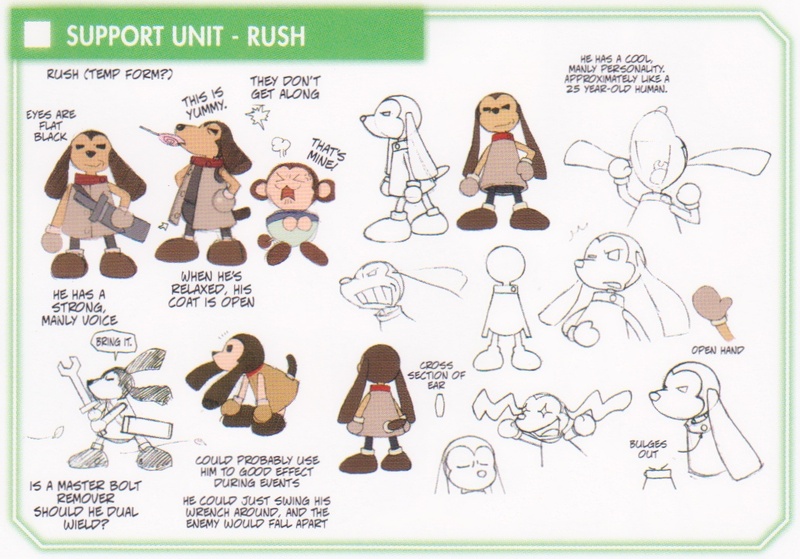 Of the three, Rush got a head start in the series, appearing in the very first EXE installment as an enemy virus, as you may remember. But did you know he was originally designed to be a DASH character? Rush Was A Character From Another Game? 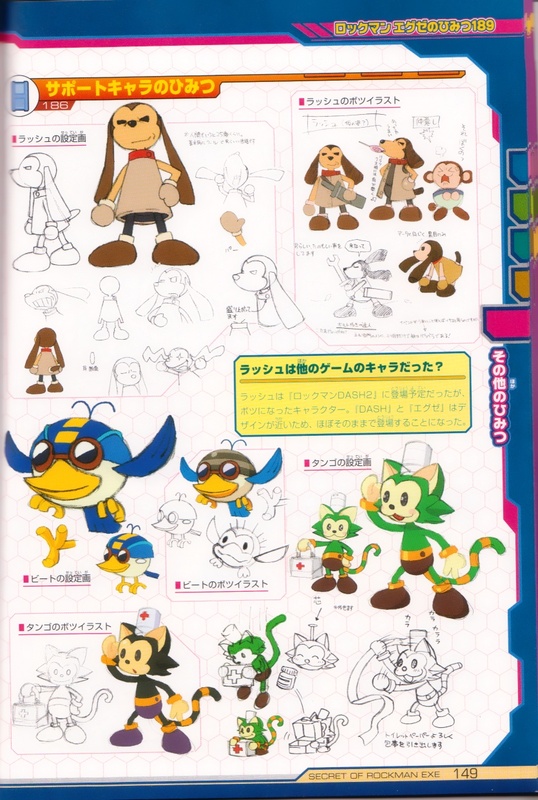 Rush was character that was supposed to appear in Rockman DASH 2, but wound up getting cut. 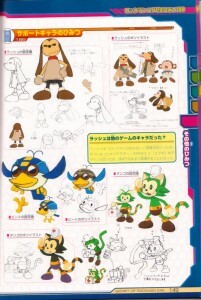 Because the design style for “DASH” and “EXE” are so similar, he was able to be included in this series with hardly any changes. 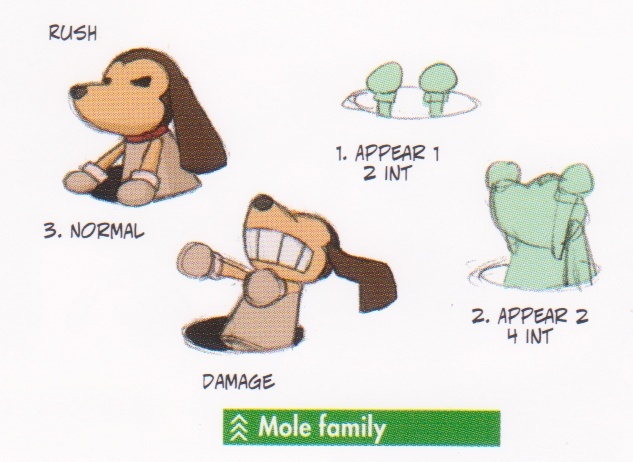 Below are some of the same images of Rush and the others as they appear in the Battle Network Official Complete Works, featuring translations of the design notes for easy reading. Rush initially would have wielded a sword-like wrench that would make short work of the many giant robots inhabiting the world of DASH. He also would have provided Data with some comical aggravation. 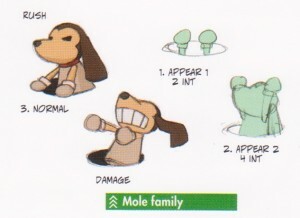 Above we see the virus form of Rush, or “Mole” as he was called in Battle Network 2. His Rush Holes take the canine pastime of digging to whole new dimensions (literally). Beat shakes a tailfeather in delivering powerful chips. Aside from using Rockman.EXE’s helmet instead of classic Rockman’s, his design features more cartoonish features than the original Beat. Note the two feathers sticking out on top and the goggles around his eyes. Tango’s makeover is even more extreme. Talk about walking out of an old cartoon! There’s a lot of color and personality in this design that I adore (though admittedly, as a cat person I am biased). 7 Comments to "DASH, Don’t Rush"
I guess I can understand why the Developers decided against putting Rush into Legends 2. With the loss of technology that allowed for teleportation, it would mean that Rush would have to run around and follow Volnutt everywhere he went in order to provide support (Monster Hunter Felynes come to mind here). Perhaps having him constantly disassembling reaverbots or chucking his wrench at them would make the game a little too easy?? I wonder how Trigger would handle any spats between Rush and Data. Take away Rush’s wrench, maybe? These Rush concept drawings are absolutely hilarious! Especially the expressions! Shame that Rush never had a large role in the EXE games. 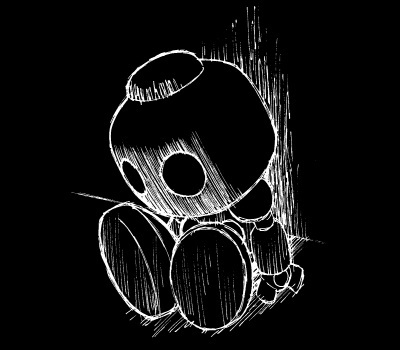 Why weren’t there plushies? Seems like somebody in marketing fell asleep at the wheel there. They could have made easy money! 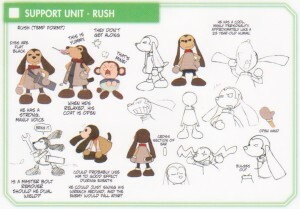 I have a feeling that if Rush would appeared in DASH2, he only would have been helpful in cut scenes and not during normal game play. I do wonder how he would have been introduced, too. He’s got a cool-but-sneaky aura about him, like I could imagine him being a spy for Sera or something. I think he’d make a good assistant for Barrett. I can picture the two of them working to repair hover bikes, playing jokes on each other and getting into fights. Kind of like “an old man and his dog” huh. yeah that could work. This Rush is more of a Mole to me. I don’t understand why they called this Rush. Nonsense to me. Just saying. By the way, your site need to update more often. Give up ?